Small things is a book of mini-anti-essays, part of Sky Gilbert's project to dismantle and challenge the rigid classifications of genre, thus challenging 21st century notions of truth. Inspired by Oscar Wilde, Foucault, and the post-structuralist project, the small writings in small things are story, essay, and memoir combined. They question the notion that an essay is necessarily fact, or fair opinion, or even informed opinion, while at the same time challenging the dictum that fiction might necessarily be free of didacticism, or at least, ideas. What a great book!! It kept me engaged from the beginning until the end! I cannot wait to read more from this author. 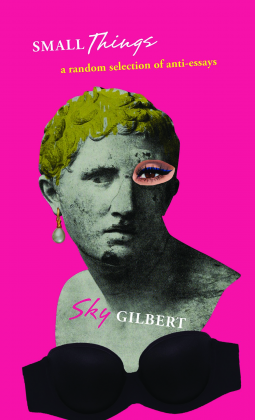 Part essay, part flash fiction, part memoir, Sky Gilbert has created a genre of their own. Each insight makes a reader think - is this truth, is this fiction, what is truth? This is a rising voice in literature and one I'm excited to watch.